Southern Brazil´s main metalmechanic event, Intermach will gather, from September 17th to 20th, 2019, the main market machine, equipment, solution and service suppliers, focused on releases and innovative technologies. One of the main novelties will be the Industrial Service space within the trade show, with welding, chrome-plating, galvanizing, metrology solutions, among other options. The professional qualification will be another aspect that will be focused. Besides the Technical Congress, free Workshops performed by exhibitors will be held. ‘This is the only market event in Brazil, that, besides trade show visiting, provides professional qualification by means of lectures and workshops, quick business deals in the business round, and a specific area dedicated to industrial services’, says Richard Spirandelli, Messe Brazil´s director. In its 12th issue, the expectation is overcoming the 150-exhibitor milestone, with emphasis in machine, equipment and service technologies focused on manufacturing park modernization and Industry 4.0 solutions. The trade show attracts exhibitors specialized in tooling, plastic, industrial automation, logistics, testing, boiler making, and treatments, among other suppliers focused not only on Santa Catarina´s strong industrial pole, but also on Brazil and Latin America, due to the diversified visitor presence. Held every two years, in 2017 the visitor number reached the 18-thousand people milestone, originated from 13 states from every country region, especially SC, PR, SP and RS, and from other countries, including Germany, USA, Colombia and Mexico. The visitor quality was evident in the profile assessed in the event. 46% hold strategic positions, 22% participate of the final purchase decision and 20% recommend it. 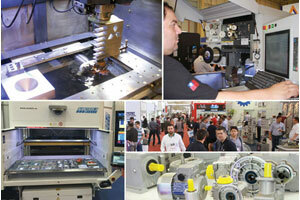 55% visited Intermach with the purpose of knowing new products and 26%, new suppliers. The field with largest professional number was engineering (16%), followed by cars, (12%), industry services (10%), electronic, electro-electronic and home appliances (8%), plastic (8%), casting (6%), power (5%), civil construction (5%) and steel industry (3%). The event location is another advantage, as it takes place within one of the country´s most industrialized regions, a reason that guarantees its success among the field exhibitors and visiting professionals. ‘Moreover, within so many digital relationship alternatives, the trade show fulfills its unique role of personal relationship, business and qualification, and it has stood out as the most complete B2B market investment. It is the tool that generates more credibility in negotiations, as nothing replaces face-to-face relationships’, says Spirandelli. Intermach – International Metalmechanic Industry Technology, Machine, Equipment, Automation and Service Trade Show and Congress – is an industrial manufacturing technology reference, triggering the industrial market. It introduces technologies, innovations, trends, develops business and relationships, and fosters knowledge. The event gathers industrial market supplying companies and hosts local and overseas visitors searching for innovative solutions. Time: 2 p.m. to 9 p.m.